Leaves changing colour: When I lived in Australia, I didn’t get to see the same colour change in the leaves in the Autumn (plus, October isn’t Autumn in Oz). I love the colours of autumn, especially the oranges and reds of October. Cooler temperatures: I love sweater and scarf weather, and while I’m not a huge fan of the frigid winter temperatures, I love the cooler, cozier weather of October. Saturday trips to the country: Nothing beats a trip to the farm markets, apple orchards or pumpkin patches in October. I love buying harvest produce, going apple picking or choosing the perfect pumpkin. As a kid, my parents would take us out for walks in the fields, tractor rides and to play in hay bale mazes. Not going to lie, I still love doing all of those things. Thanksgiving: Canadian Thanksgiving falls in October. It’s one of my favourite holidays, because it’s not as chaotic as Christmas, not as busy as Easter and is the first long weekend after things go ‘back to normal’ after summer. When my brothers and I were in college and uni, it was also the first weekend when we’d all be home from school. Oh, and there’s always pie. Halloween: I love the fun of Halloween; decorating, carving pumpkins, going to Halloween parties and handing out candy to trick-o-treaters. Not to mention scary movie marathons and the Simpsons’ Tree House of Horror specials. 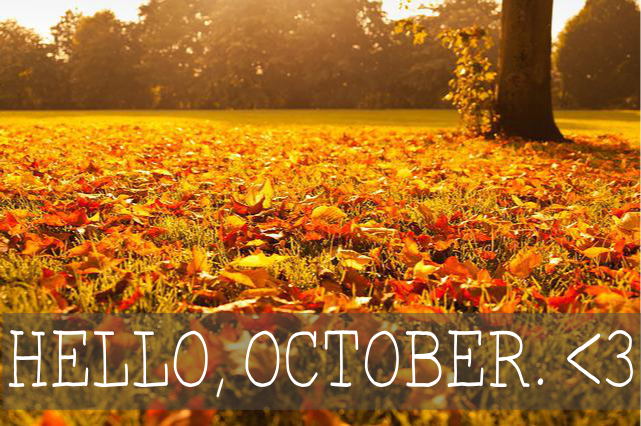 Do you love October? What are your favourite things about this time of year?